a short video with screen shots and audio from a typical experience with using Beat Vox. the first step...record a short snippet of your voice. say anything you want! and finally, capture a recording of the results when you like what you hear...and email it to yourself. Beat Vox is an interactive sound installation designed to create rhythmic beats out of spoken word contributions. Participants record themselves speaking and the custom-built software slices up the recordings into bite-sized chunks of audio and uses those to create rhythm-based music. Human speech is much more than simply a mode of communication, and Beat Vox enables people to experiment with re-mixing their own voice into something musical. 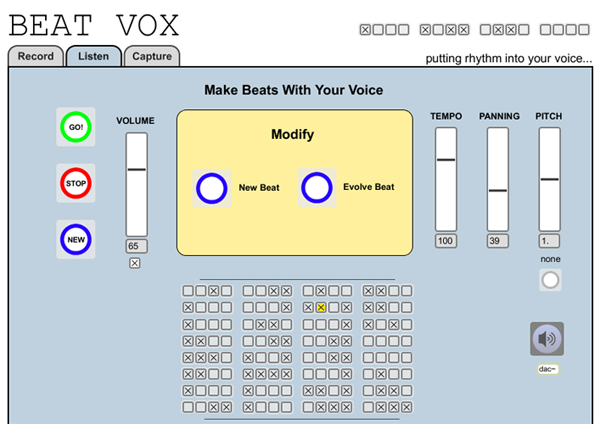 Beat Vox consists of a computer, a microphone, a touch screen, four speakers and custom software designed to transform human speech into rhythmic music. Beat Vox currently is realized in the form of a small sound-resistant booth, though it can be installed in a variety of different spaces and configurations. The custom software was developed in Max/MSP and runs on either a Mac or a PC. 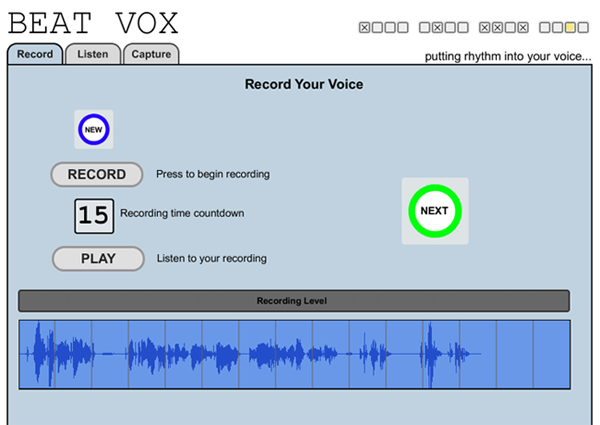 In order to participate in Beat Vox, participants will first use the microphone to record themselves saying whatever they want for up to 20 seconds. They can then listen to what they have recorded and either re-record or hit the GO button. With the GO instruction, the software analyzes the audio recording, listening for onsets of words and certain volume and pitch changes which will determine how the recording is sliced up. The result is a number of short clips of audio – anything from short phrases to words to syllables to phonemes – based on the particular way the person speaks and the tuning of the slicing algorithm. These audio clips are then used as if they were each a percussive sound, such as a cymbal, a snare drum or bass drum, and are played back rhythmically to form a ‘beat’ of spoken human voice. The software is programmed to randomly create beats based on certain parameters, and also has several user interface controls which enable the user to change what they hear by, for example, requesting new rhythms, changing the tempo or pitch etc. Playback is in surround sound with different audio clips moving spatially around the participant. There is no additional audio added to the mix; all sounds are taken from the spoken voice recording, but when treated in this way, many of the resulting sounds are not readily identifiable as spoken words. Participants are also able to capture up to 30 seconds of their remixed voice recording and email it to themselves if they like what they hear. 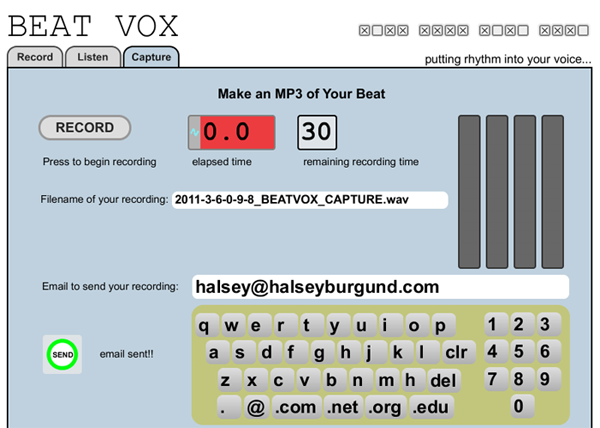 They can choose to share their recording with other Beat Vox participants too. Enabling users to listen to what other users have done with Beat Vox will hopefully inspire and surprise. Everyone’s voice is unique to begin with and adding the self-remix creates an extraordinarily broad picture of the human voice well beyond the expected. Beat Vox gives users a chance to experiment with the musical potential of their own words and voice and perhaps create something unexpected out of something typically considered mundane. Hopefully, participants will not only enjoy creating music with their voice, but will also experience a shift of some sort in the way they listen to human speech – their own and that of others. Human speech is, of course, used primarily for communication, but if one listens with a more open ear, rhythms, melodies and other exciting musical artifacts can be heard and appreciated.